As a fan of the classic and highly memorable role playing trilogy The Bard's Tale (or 'Tales of the Unknown'), I've kept collections of maps and hacking notes from my youthful adventures into the land of Skara Brae, the wilderness, and multiple nearby dimensions. There was a Bard's Tale fan site I frequented called The Adventurer's Guild, built by Tom Greene, which in time closed down. With that news, a few people stepped up and offered to mirror his entire site - one of whom was myself. To ensure all that collected knowledge wouldn't be lost to the void, I duplicated the site and let it sit, continuing to serve fans of the series and its newcomers. It's been wonderful to hear from new fans of the series who've discovered the fun of the classic dungeon crawler through the online Bard's Tale community! 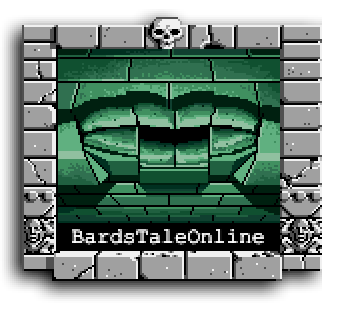 In 2015, partly in celebration of the site's 10th anniversary, but primarily because of the official announcement of the development of Bard's Tale IV by Brian Fargo and inXile Entertainment, I've once again redesigned the site scouring its content with a fine-toothed comb, to once again keep up with a revitalized Bard's Tale community and internet environment. Every few years I'd replay through a game in the trilogy. It's a considerable task, reviewing all my maps and actually going through the games again to find anything I may have missed in the maps to provide a comprehensive resource. One great reward is seeing how similar everyone's methods of mapping and notation seem to be. Over the years I've changed my archival methods a few times: my first BT map was enormous and drawn out on grid paper, and my most recent map is 1/4 the size (4 spaces per grid), trying to fit as many maps on one page as possible, including map notes! The trusty grid symbols, however, have stayed the same all these years. Those maps and game notes, together with various other resources from the community, have built this website into what it is. My hearty thanks goes out to you for your support over the years, and most importantly to Brian Fargo and inXile Entertainment for continuing the Bard's Tale saga with the development of Bard's Tale IV! Anyway, I hope you enjoy your stay - Now go and venture into the wilderness... and keep alert!